Kevin Harvick earned his ticket into the NASCAR–Championship Four by winning the AAA Texas 500 at Texas Motor Speedway Sunday (11/4/18). Before the green flag waived to start the race, one driver in the Round of Eight knew he was guaranteed a chance to win the 2018 Monster Energy NASCAR Cup Series Championship, Joey Logano. The other seven NASCAR Playoffs drivers still in contention knew that winning in Texas would give them the magic ticket to Homestead-Miami that Joey got the week before. 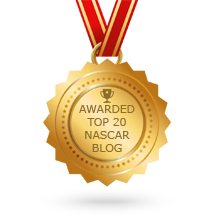 When the race began those drivers began their drive to set themselves up to earn that “golden ticket.” The drivers that are not in contention for the title still wanted to win the race. Several of them looked as though they could play spoiler to the playoff drivers. Five of the seven drivers that exchanged the lead 16 times during the race were not playoff drivers. However, the driver that led the most laps was Kevin Harvick. Kevin led a race high 177 laps and he is one of the remaining eight playoff drivers. Most of the race saw very little on track incidents. There were only four caution periods through the first two stages of the race. One was a competition caution NASCAR chose to issue because of the rain overnight and the day before at the track. One was for an on-track incident. The other two were at the end of those first two stages that Kevin Harvick won. The last four caution periods came in the third and final stage of the race with three near the end. Kevin Harvick and Ryan Blaney had established in the race that to win the race you would have to beat them. Kevin had been edging out Ryan for the most part as the fastest car in the race. The final yellow flag issued also sent the race into NASCAR’s overtime of a “Green-White-Checkered” finish. It also brought Kevin back from his sizable lead he had established over Ryan. It gave Ryan one last shot at getting out in front of Kevin and claiming the win. When the green flag waived Kevin showed just how much faster his car was. He rocketed out to the lead and stayed there for those last two laps to claim his second career Texas Motor Speedway win in NASCAR’s top division. The win also makes back-to-back AAA Texas 500 wins to advance to the Championship Four after his win in the race last year. Ryan Blaney turned his pole position start into a second place finish with Joey Logano claiming third place in the race. Erik Jones came across the finish line in fourth place as Kyle Larson rounded out the top five. See the complete race results for the AAA Texas 500 here. Kevin Harvick and Joey Logano can race a Phoenix next week with no pressure. They know they will be one of the four drivers with a shot at the tile the following week. For the two drivers above the cut line the pressure will be simply to perform well to make sure they advance. The four drivers below the cut line will need to have a great day with some help (one of the two above the cut line having a bad day) if they hope to advance in the very least. In reality, the four below the cut line will likely have to win the elimination race next week to advance. 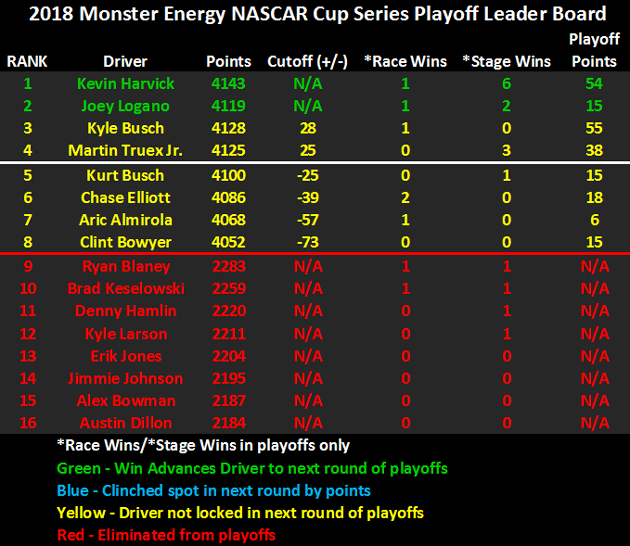 Below is how the Monster Energy NASCAR Cup Series Playoff Leader Board looks heading to the final race of the Round of Eight. We will find out what two drivers will advance and join Kevin and Joey in the Championship Four at the end of the last race in the Round of Eight. That NASCAR elimination race is the Can-Am 500 at ISM Raceway in Phoenix, Arizona Sunday, November 11th.